. no bake holiday cookie energy bites . - . running with spoons . « . link love 12/22 . 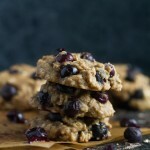 These energy bites sound fabulous specially seeing they are so healthy! I have been craving healthy stuff too – made a huge pot of broccoli and olives last night and eat 2 plates of it! Merry Christmas to you and your family Amanda! These look scrumptious! Perfect for a healthier holiday snack amongst all of the sugar and butter filled Christmas desserts! These look delish. I had two white chocolate cranberry cookies right before bed last night… mmmm! These look so pretty! I think they’re even too pretty to eat (read: not). And the frosting….I’m not sure if it would actually make it on the bites…..
Have a wonderful holiday, Amanda! I will “see” you when you return! Will you forgive me if I tell you that I’m not sure I’ve ever tried the white chocolate cranberry combo? I promise I’m planning on changing that!! Between these and some white chocolate cranberry scones I’ve seen, I think I’m destined to try the combo soon. Have a lovely Christmas, Amanda! Wow!! THese look amazing!! So delicious!! YUM!! Thanks for sharing! I hope that you have a lovely Christmas! those look so freaking tasty. I can’t wait till I actually get the time/energy to make my own energy balls like that. I still have yet to try LCotter’s bites but I swear they are on my ‘need to order’ list. These look right up there! I’ve definitely been feeling all. the sugar! At work we were discussing if there were any alternate name for these dessert (or healthy) balls. I like yours – bites. I’m going to go with that. Regardless, these look delicious. I love anything that doesn’t have to be baked! Good luck with the Christmas prep! See ya on Thursday! Have a very Merry Christmas! I hear you on the overdoing sugar – as much as I love my sweet tooth, I often crave “real” food when I have had one too many cookies, frozen yogurt and/or chocolate desserts. Have a great Christmas, Amanda. I hope to hear from you soon! OMG I cant wait to try these. Thats an awesome flavor combo that I love! You had me from “no bake” hhaha oh and white chocolate I suppose. These looked amazing when you posted them on Instagram and they look amazing now. I love any kind of energy ball because I think they can be made year-round and because they’re suuuuper simple. Happy Holidays! I’m getting a tad bit baked out myself… and the worst part is that it’s not over yet 😆 Merry Christmas, Erin! PS: Please, please, please teach me your photography ways. Your photos are always stunning. I’m actually planning to invest in a new camera sometime soon. What do you use? Thanks, lady! I’m totally the same way! When I like something, I really like it haha 🙂 I drive people crazy listening to the same songs over and over again! I am so with you on being sugared-out. I am trying to slowly wean myself with overnight oats 🙂 I like how you are transitioning with these energy bites. Happy Holidays. you put my bites to shame.. haha. Wanna come work for me? LOL! I think I’m slowly getting to the oversugared point myself…not quite there yet though, considering that I just ate some post-lunch cookies 😉 I definitely agree that the white chocolate and cranberry combo is delicious. Definitely keep these in mind for when I need some not-quite-so-sugary treats! 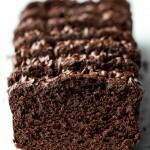 This recipe looks awesome – my kind of “baking” for sure!!! LOL- Is ‘Whir’ a word? If not, it better be- best way to express the motions in a processor! 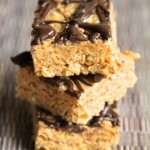 Love the no bake aspect- We must be on no baking wavelengths this week! Have a great Christmas buddy- secretly hoping mama spoons makes you pancakes Christmas morning. It is a word! 😛 And you better be sharing the recipe for those truffles soon! I am all over these little gems! In fact, Im so all over them that Im making them….right….NOWWW. Merry Christmas to you and your family babe! Oh Yum!!!! I am SO making these!!! I totally feel ya on craving some distance, considering I went ham on the double chocolate peppermint cookies I posted today! Tis the season for boatloads of suga and buttah. Thank God there’s fab food bloggers like you to keep us sane with yummeriffic healthy cookie bites! Love it. I’m a sucker for white chocolate. Considering it’s a base of butter and sugar I’m not at all surprised. I love all the healthy ingredients in these: oats, honey, cranberries, and I can relate to craving veggies. It’s usually my body’s way of saying enough sugar, bring on the nutrients. I am with you on the sugar overload.. I still have three more Christmas dinners to go to, not to mention my families annual Christmas Eve cookie baking party..
You know how there’s the trifecta of ingredients for jambalaya, I think red peps, onion and celery? I could be wrong on that. But you’re so right with the almonds, honey and oats thing! It’s energy bite trifecta. I bet the orange zest adds a wonderful bite to these. Yum! Thanks for the comment you left on my blog today. It’s nice to hear from someone who understands. I responded back to you. Us introverts gotta stick together 😀 Merry Christmas, Jen! Yum! Just pinned these, thanks Amanda! Oh these sound amazing! Another recipe I can’t wait to make once I get a working food processor/blender. These sound perfect for the christmas flavors and healthier than the cookies I have been baking. I adore these, all the same holiday fun as any other holiday recipe without the sugar headache after. Merry Christmas to you as well, Aqilah! I love cranberries and this energy bite pretty much sounds amazing. You have such “clean” ingredients!! Totally trying. I am the same way when I love something! I noticed some changes to your recipe format…. What plugin is that for the recipes? Lol I’m still learning self hosted thanks for your help!!! This one is called Recipe Card. THAT CRANBERRY looks like a heartttt!!!! Did you do that on purpose? LOL! Brilliant photos! So pretty! These look great!! What a perfect post to end with. I TOTALLY THINK that cranberry looked like a heart too!!! I am all over these..minus the white chocolate though!! Please don’t hate me. 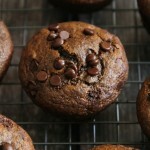 Maybe I will drizzle dark choc instead, I know it’s not the same…but it’s dairy free for meee! Can’t go wrong with white chocolate and cranberries!! These look SO good!!! I am so with you on being sugared out. I think every day in the past week has involved either cookies, cake, or ice cream. Now I’m fine with that, but as I type, I’m chowing down on carrots, celery, and grape tomatoes. Just craving them. These look so perfectly delicious and satisfying while being healthy in the midst of all the sugar and butter. Thanks for sharing! 🙂 and of course, Merry Christmas!!! Merry Christmas to you as well, Alison! These legit look incredible! I’m getting a litttttle over the butter and the sugar (it won’t last long don’t worry!) so these would be the perfect alternative. Can’t wait to get home and whip out the food processor!!! Haha! I am the EXACT same way! I get totally fixated on one thing and can’t get enough of it until I’m sick of it! Flavors, songs, hobbies…you name it! I can’t help it, I have an obsessive personality! These look fantastic! I can’t wait to make some! Coming over from the SITS sharefest. These look great and the perfect way to detox from the sugar overload! Those pictures are drool-worthy. 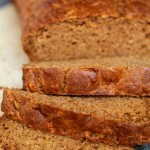 This looks like a recipe simple enough for me to try…looks delicious! Hi, I really want to try making these! Can you tell me how I would store them as I certainly won’t be eating these all at once! Should they be refrigerated or stored in sn air toght container? and also hos long will they stay keep? Hope you reply thanks! I always keep mine stored in an airtight container at room temperature. If you need to keep them for longer than a week then I suggest refrigerating them. 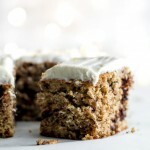 HI Amanda, I love your “bites” recipes and would love to try these here – but cannot find the recipe, I have scrolled up and dwon a dozen times, but maybe I am blind >_<?? The recipe seems to have disappeared from this post for No Bake Holiday Cookie Energy Bites. Are you able to email me the recipe? I sure would appreciate it.